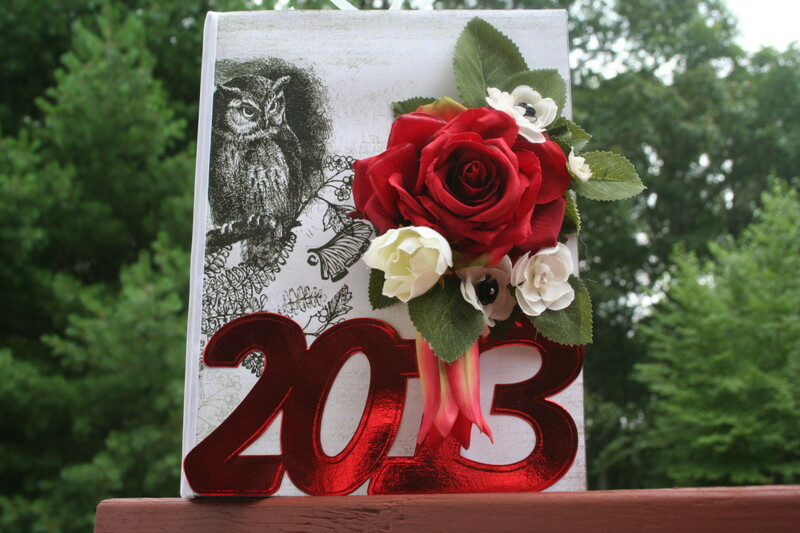 Creating a Graduation Scrapbook Album for a gift! 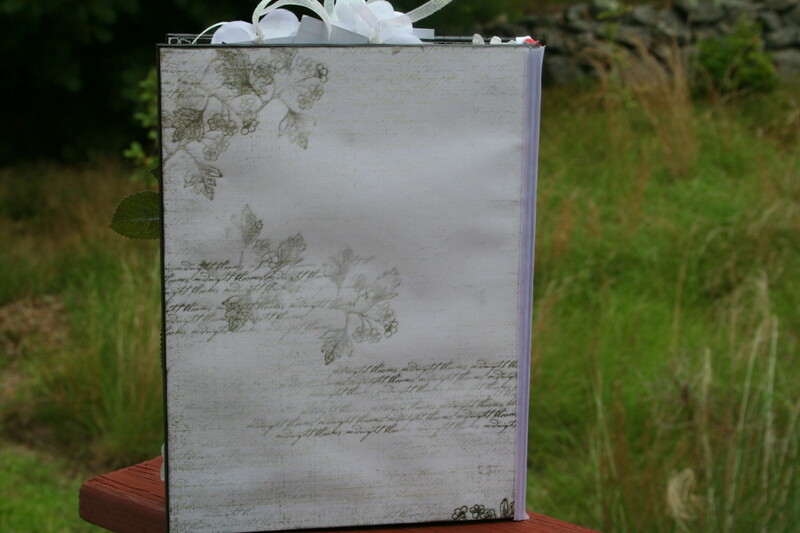 The front cover is decorated with a handcrafted silk flower arrangement. 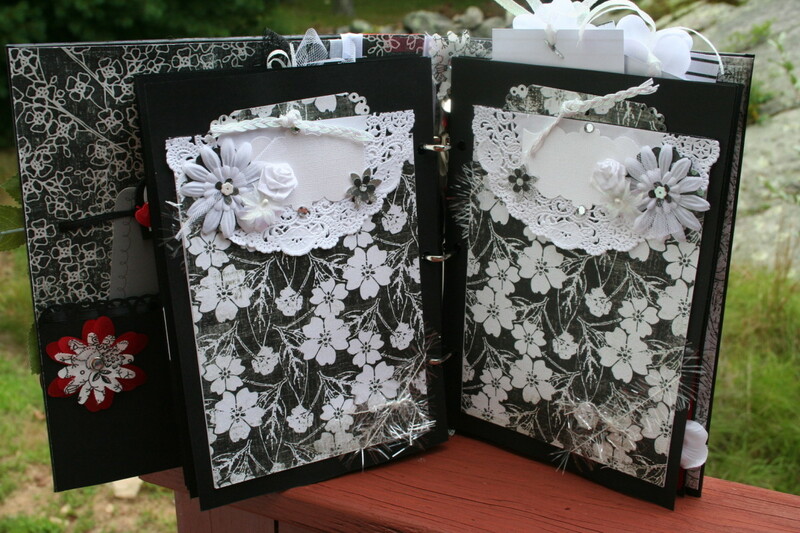 Using a re-purposed photo album to create your scrapbook. There are all kinds of ways to start a scrapbook. 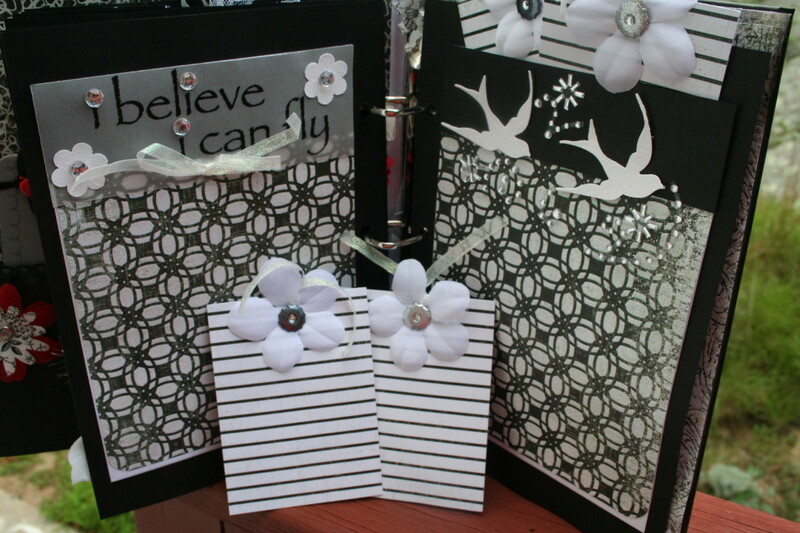 Many different ideas come to mind including paperbag albums, card & envelope albums, regular 12 x 12 albums, etc. One day while shopping, I came across a sale on photo albums. I found a 10 1/2" tall by 8" wide hardcover album with a ring binder insert. I could visually see transforming it in to a keepsake album. Think about what you would like to see in your album! 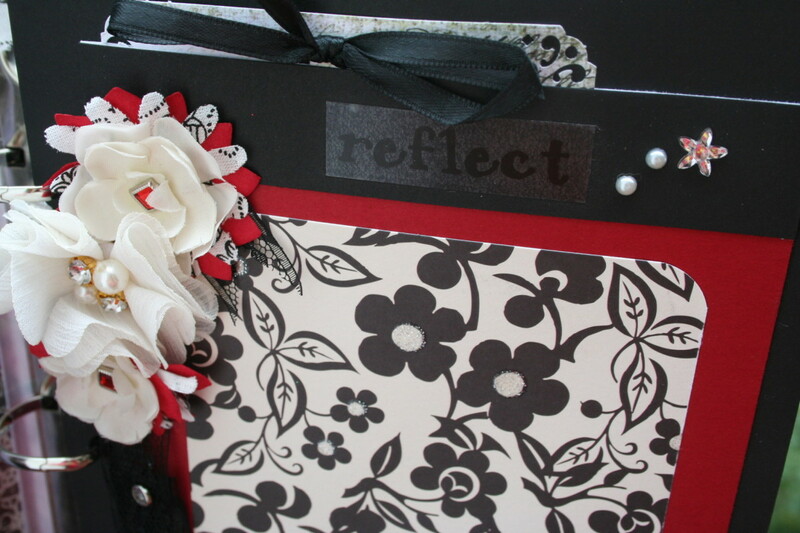 It's all about the details whether you are creating a scrapbook page or album. It's the little embellishments, flowers, journaling spots and more that create the uniqueness to each memory keeping design! As I walked through the store and thought about what I would like to use the album for, I came upon a graduation aisle filled with decorations for parties. 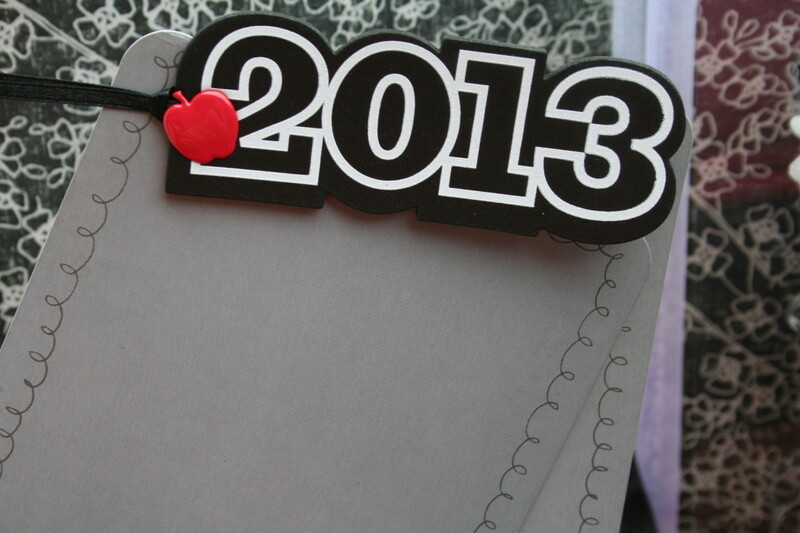 I found metallic-looking 2013 die-cut shapes in various colors and sizes. Then I came across some other interesting gift wrapping decorations. Putting it all together in my mind, I decided to create a graduation album. Adding a lot of details to your album can drive up the cost. Of course if you have the ability to create your own embellishments at home, it will be less expensive to make your own die-cuts and handmade flowers. Keep in mind when you start a project, how much money you are willing to spend on matierals. Set a budget. 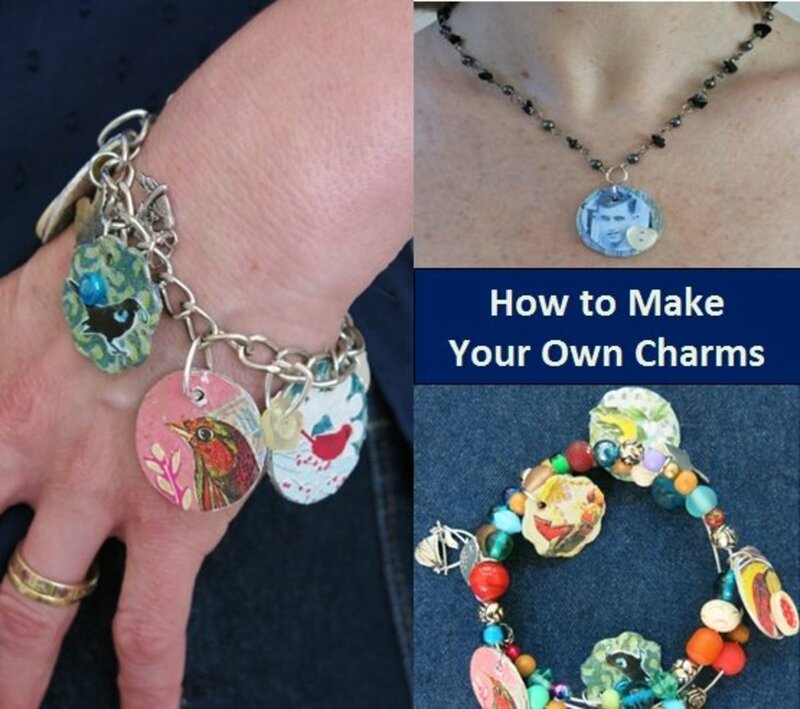 Come up with ways to make your own embellishments to keep costs down. Measure and cut the base pages. The first thing to do when creating a scrapbook album from a re-purposed album is to measure how large the pages will have to be to fit in the scrapbook album without hanging over the edges. The album is 10 1/2" by 8". That means the pages will have to be smaller in order to fit perfectly within the album. 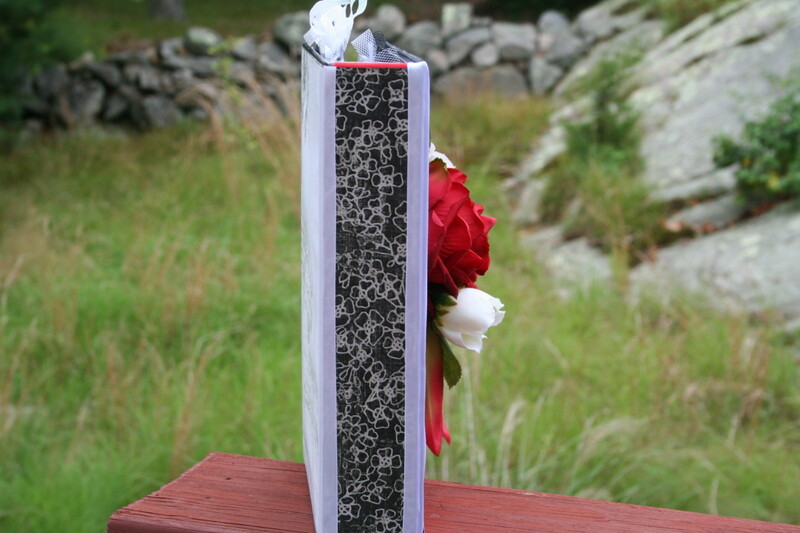 Also consider how the ring binder will come in to play with your page sizes. When you move the pages from right to left, the pages will slip around the ring. You have to deduct an amount off your page size to make sure the edges don't exceed the album at the highest point of the ring. I measured the pages 10" tall by 6 3/4" wide. This was after playing around with the pages to see what size fit. It wasn't obvious until I slipped them over the ring binder and could determine how much more they needed to be trimmed. When considering the size of the pages, also consider the width of the spine. This will determine how deep your album can become. The spine shown here is 2 1/4" wide. 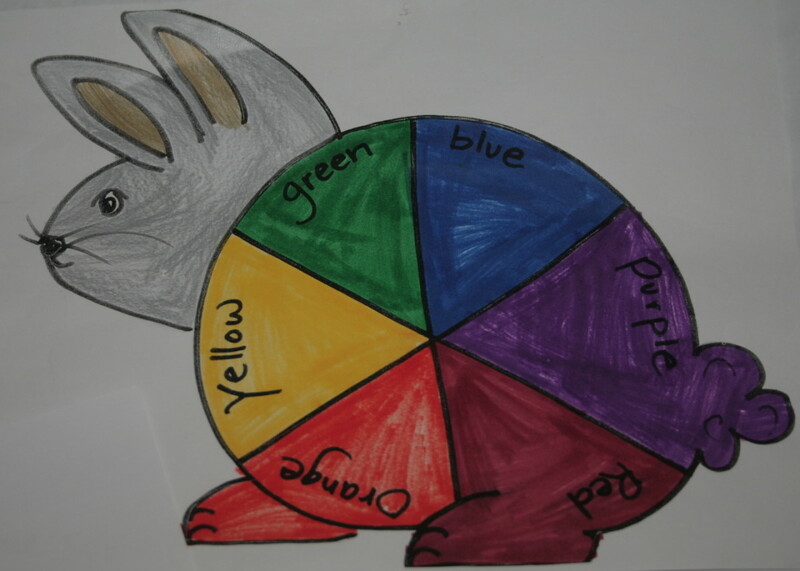 Choose theme, pattern, colors and paper. This album is a graduation album. The same techniques apply to any other album. 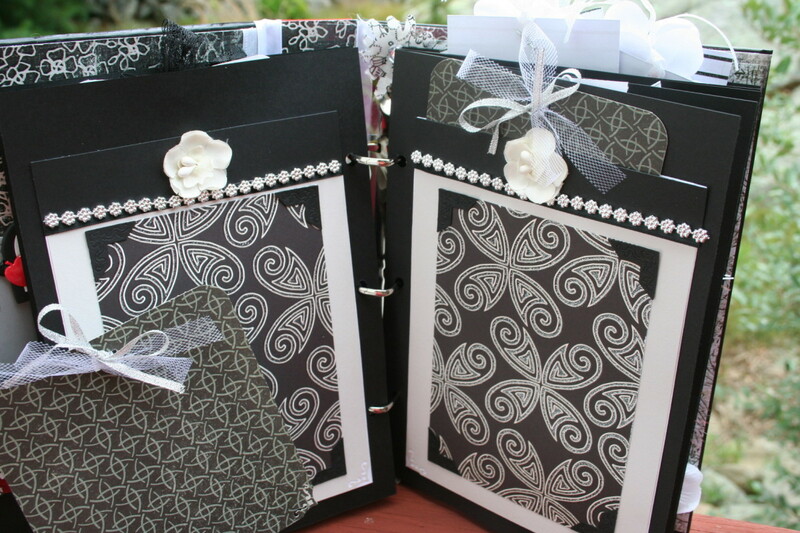 Whether it be a baby shower, wedding, birthday album, you much choose your theme. You don't want to create a birthday album and not have anything but wedding stickers at home. When you are looking for materials and supplies, consider what you are creating and try to visualize what themed-materials you will need. It will also help save money when you are in the craft aisle. Instead of picking up a bunch of mis-matched products, you'll be able to focus on only what you need for the given project. I have wandering eyeball syndrome in the craft store, despite having great intentions of spending so much money on a bunch of baby shower supplies for example, I come home with a little bit of everything but what I went for in the first place! Consider the pattern you are going to use to create your album. Polka-dots and stripes do go together. But, some color themes don't. Make sure that all of your patterns and colors match. 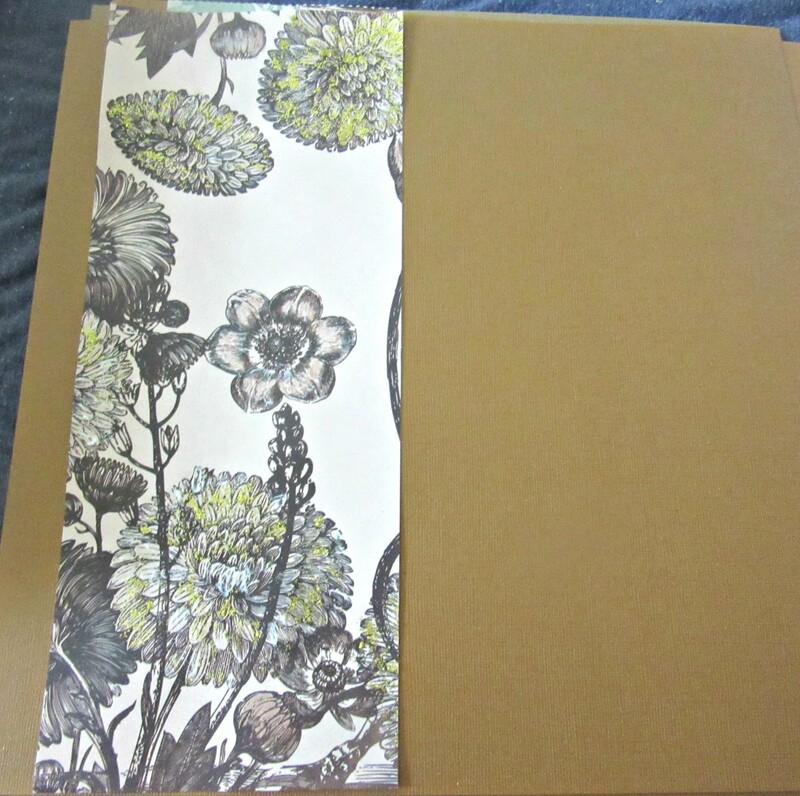 Lastly, there are amazing scrapbook papers and cardstock selections. It all really depends what I'm making that decides if I buy a pre-packaged paper stack or loose paper by the sheet. Whatever you decide, make sure that everything matches and goes together well when you start cutting and adhering it all together! Back cover using the same paper as the owl cover. Think about your layout. Organize your supplies. 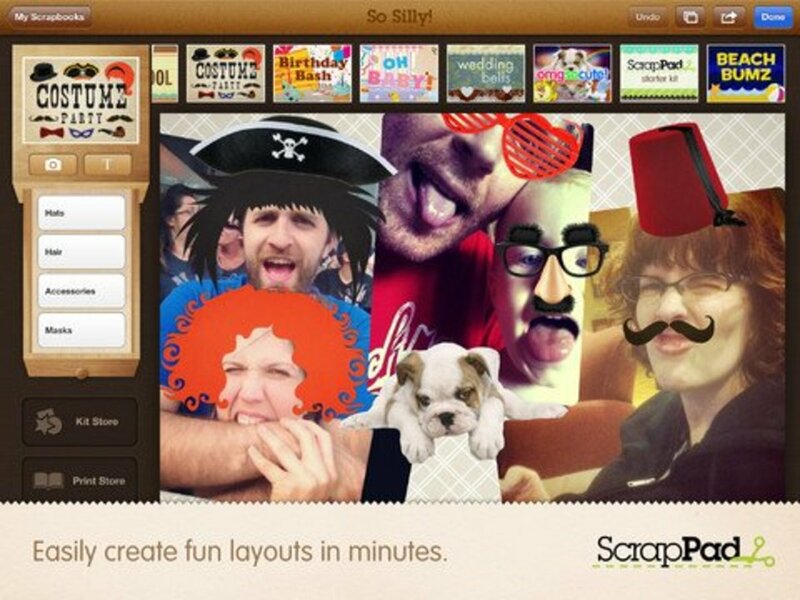 Before creating a scrapbook, you'll have to think about the theme of it and how you want to put the pages in order. When I created this layout, I made it up as I went along. I didn't have a pre-set idea in my mind. First, measure and cut your base pages. 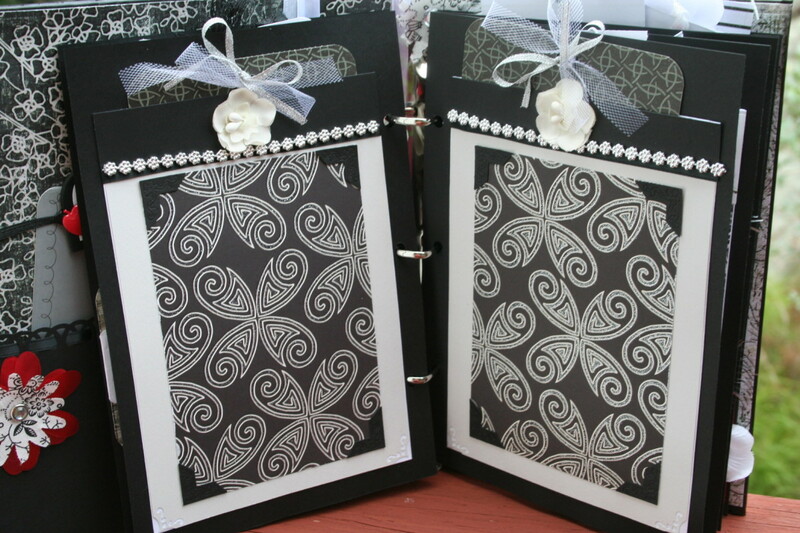 This scrapbook was created from black cardstock. I measured and cut about 20 pages to start. Punch holes in the base pages. Take one page and use it as an example to measure the punched holes. Place the page against the open rings and mark where you will punch the holes. Punch the holes and test to see if the page slides evenly over the rings. Use this page as the sample page for punching the holes in all the other pages. When you are finished punching the holes, set the base pages aside. Organize your supplies. Put all of your supplies together near your work space. I have a craft studio with a large table in the room. I put all of my supplies in piles on the table so I can pick through them as I go along. Put each like item in the same pile. 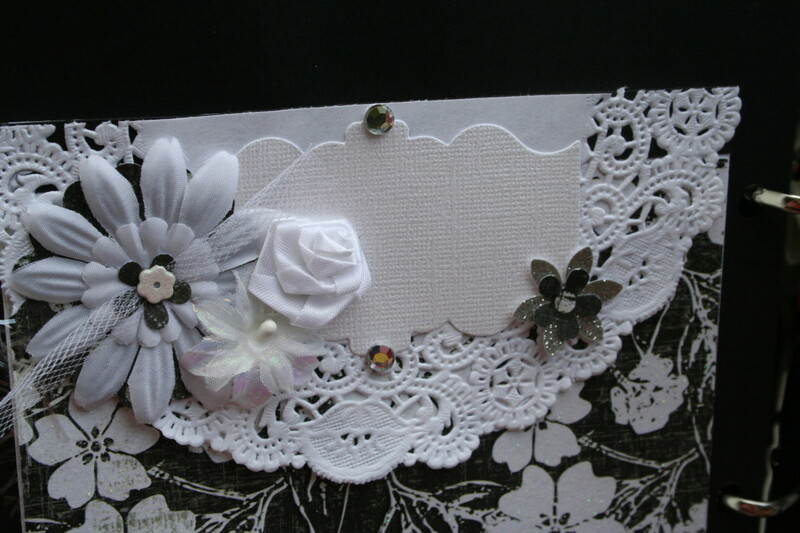 Ribbons and lace, eyelets and brads, paper and cardstock, etc. Design the covers, front and back. 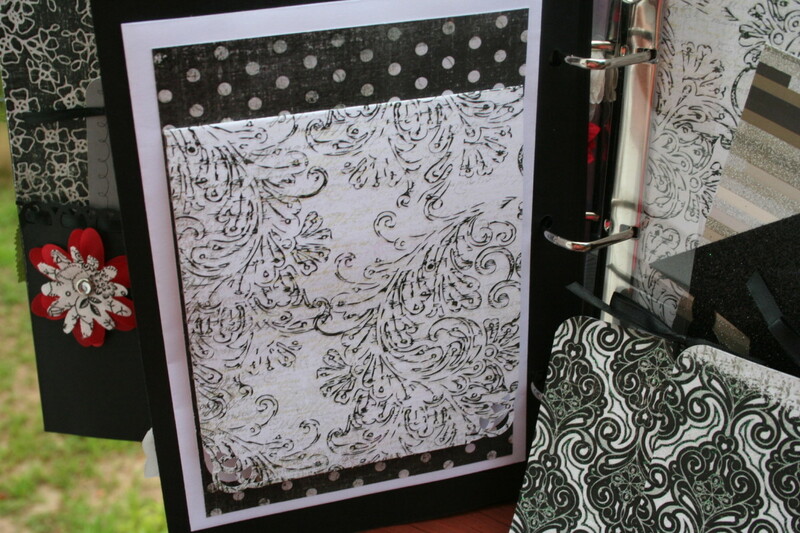 You might already have the perfect cardstock picked out and set aside for the cover. If not, give it some thought. The pattern should be unique and different from any other pattern you use inside the album. I picked a piece of cardstock with an owl design. I was able to cut it up so that the owl could be used on the front and the rest of the paper could be used on the back. Begin with page 1. The inside of the cover will open with page 1. 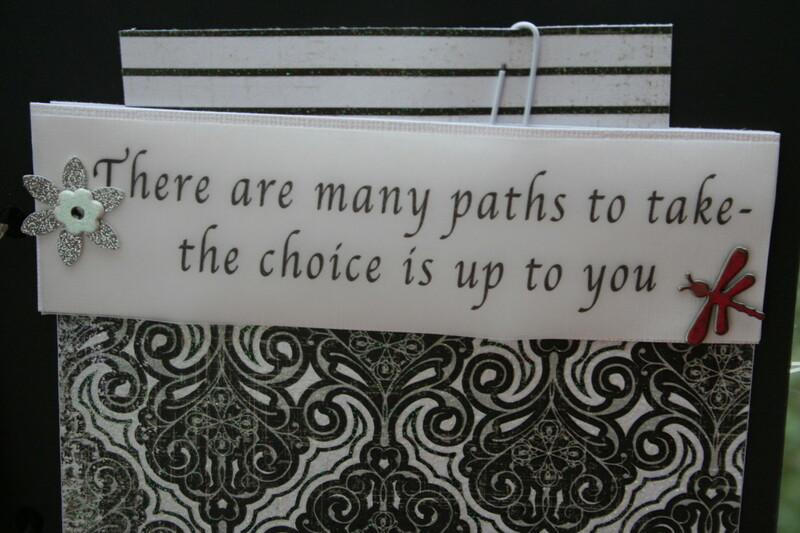 Keep this in mind when designing page 1 so it doesn't clash with the inside cover. Pages 2 and 3 and all other pages that open together. When the pages open together, keep in mind that while you can have two pages that look totally different, you'll need twice the supplies if you want the pages to look the same or similar. For example, if you want to decorate page 2 and 3 with a certain ribbon, make sure you have enough on hand. You don't want to create two pages that look the same and run out of supplies to finish. Measure and assemble your pages. 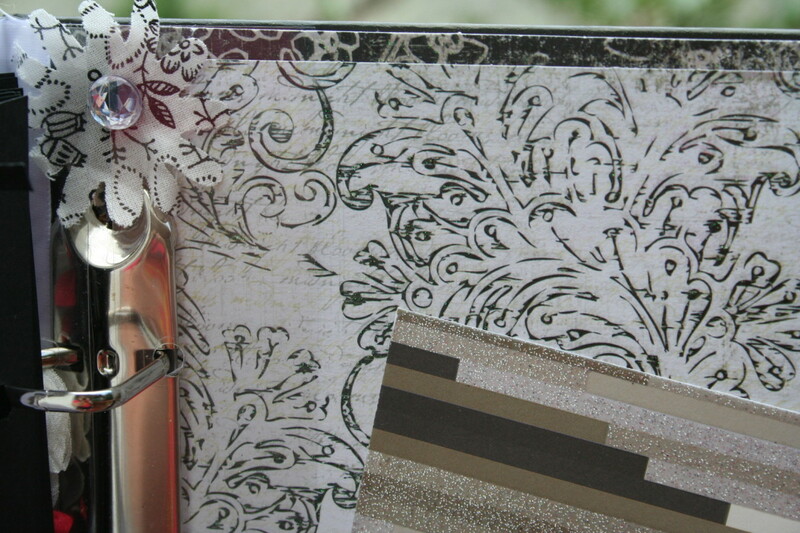 When you create your pages, measure the space you have to adhere photo mats, tags, embellishments, etc. Begin with pages 2 and 3. Save the front and back pages so that you can make sure they look well with the first and last pages. You don't want to assemble the entire album and then notice that the first and last page could have been better coordinated had you waited to see how the album came together. 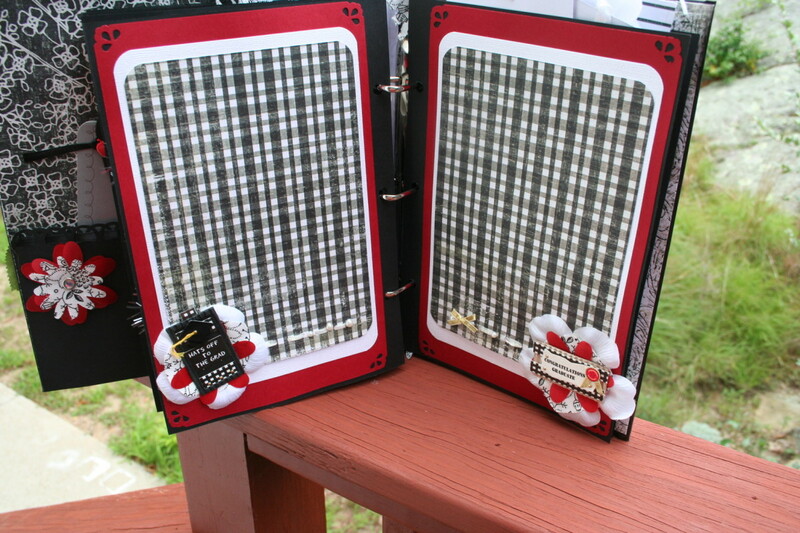 Pages 2 and 3 have large photo mats, with slide-out side and top journaling tags. 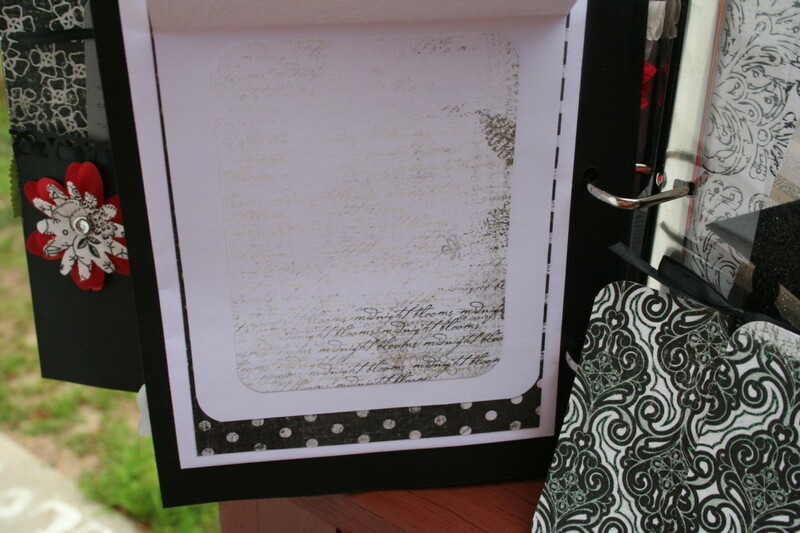 To create the top journaling tags, I measured the photo mat so that the tag could easily slide in behind. To create the side slide-out tags, I measured the unadhered space between the top and bottom of the photo mat. I also measured the length of the photo mat. That's how I was able to fit the slide-out tag perfectly centered behind the photo mat. For pages 3 and 4, I used decorative punches to add a little more interest to the corners of the tags. I used printed cardstock for the photo mats. I decorated with flowers and a row of flower trim. 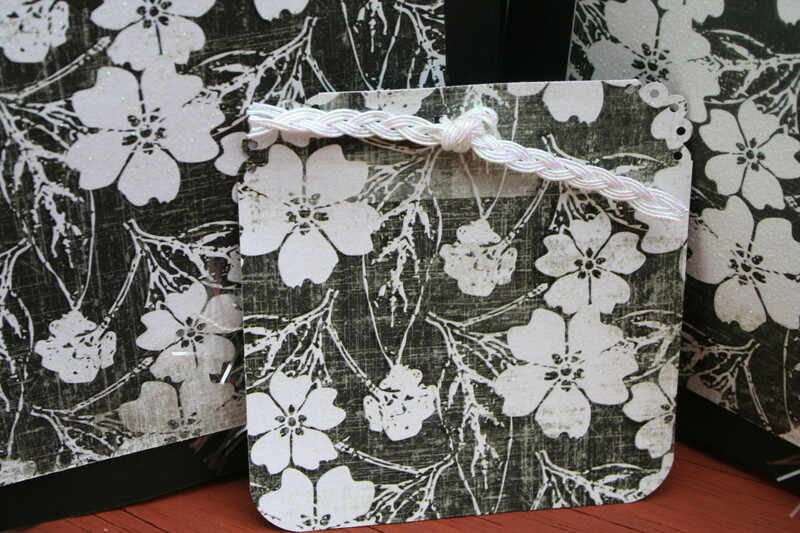 Notice how the patterned cardstock used on the photo mats coordinates with the patterned cardstock used for the tags. 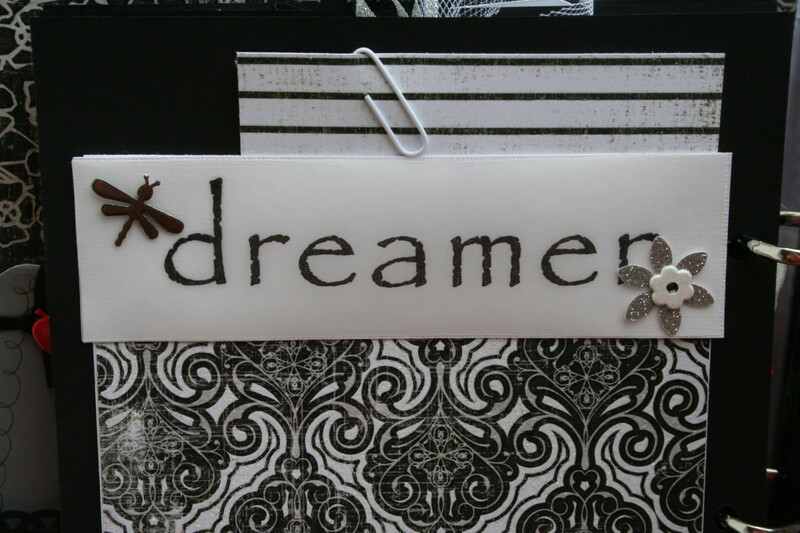 Use decorative punches to add interest to the corners of the journaling tags. Using pre-printed phrases and titles. I found some vellum phrases and titles in my stash of craft stickers. These were not self-adhering so I had to find a crafty way to make them stay on the pages without showing through to a large glue dot or splat of craft glue. I used eyelets and brads to hold the phrases in place. 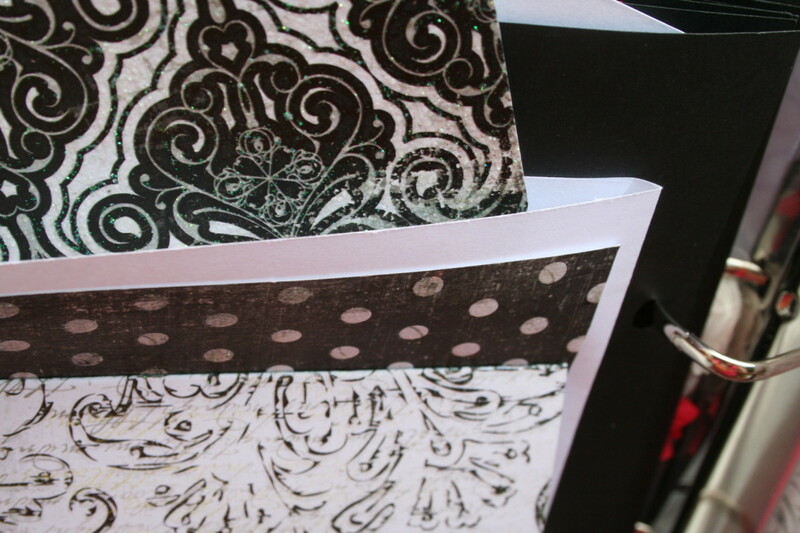 Also, for the journaling tags on these pages, I found some cardstock printed with lines. Instead of decorating the tags with ribbon, I decided to add a paper clip to each tag so that the album recipient could use the clips to hold extra notes or photos. Each photo mat is secured with a ribbon tied into a bow at the bottom of each page. Notice how nicely a photo will look on these pages, slipped under the ribbon! 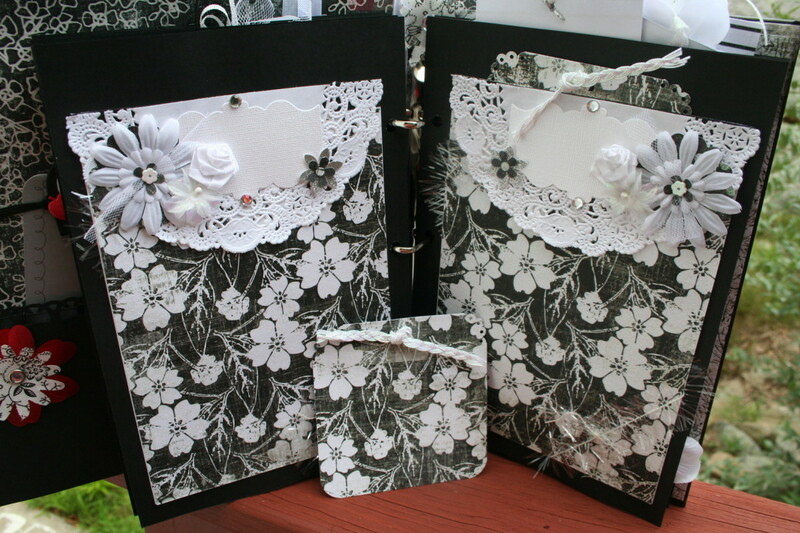 Incorporating other craft supplies such as doilies. 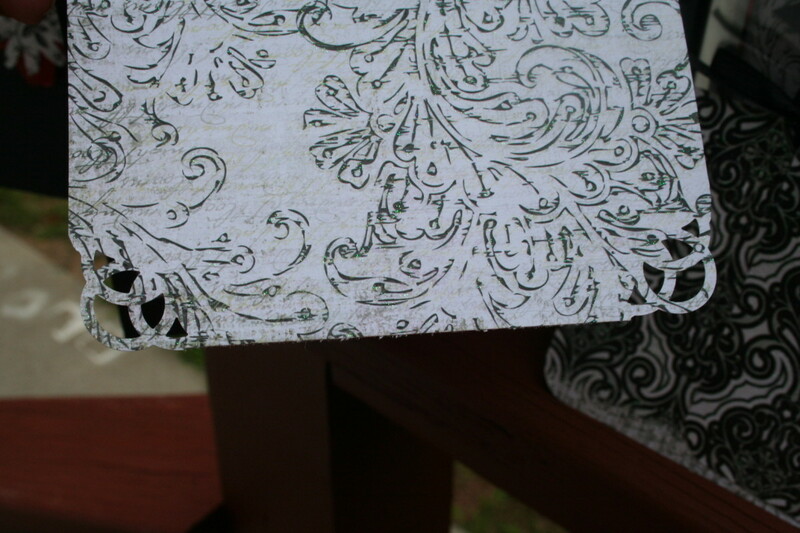 Using a doily cut in half, I made the headers for pages 6 and 7. I decorated the doilies with assorted flowers. 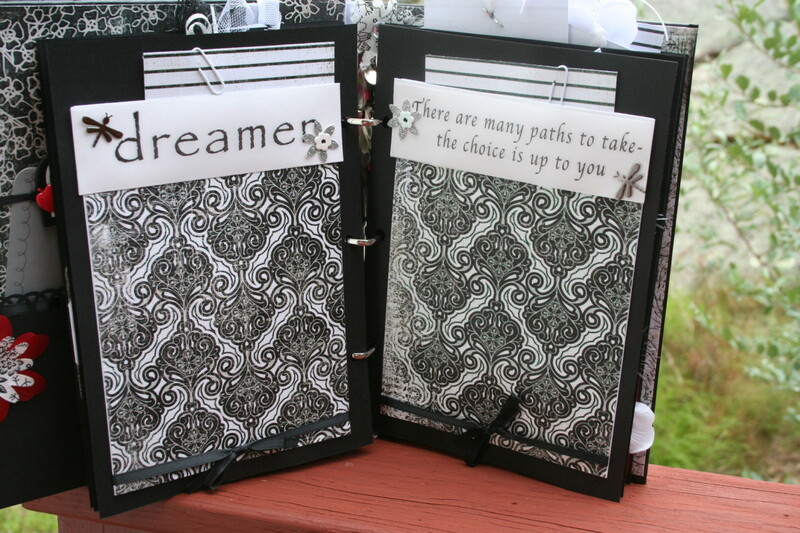 Using a die-cut machine, I created extra journaling spots from fancy die cuts tags. Notice how the printed cardstock was used for both the photo mats and the tags on these two pages. 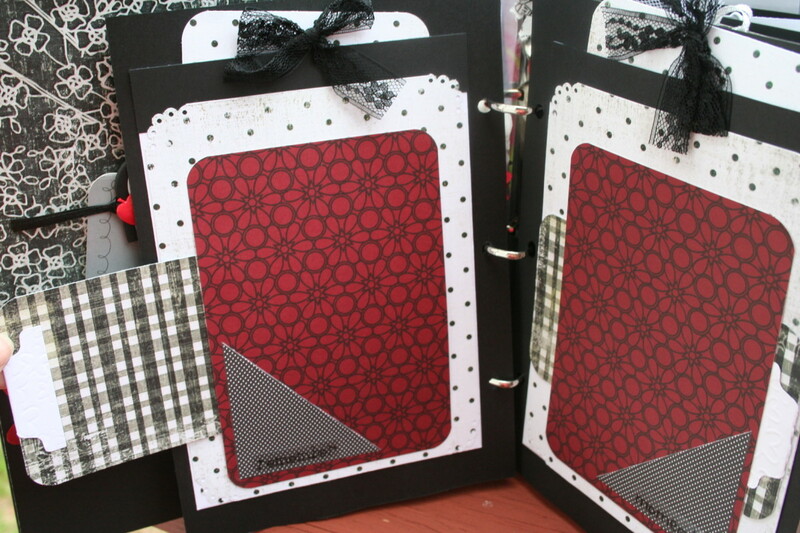 Your scrapbook pages do not have to include tags on every page. A couple notes about pages 8 and 9. The flower embellishments were made from silk flowers, fabric circles, and pre-made stickers from a craft store. 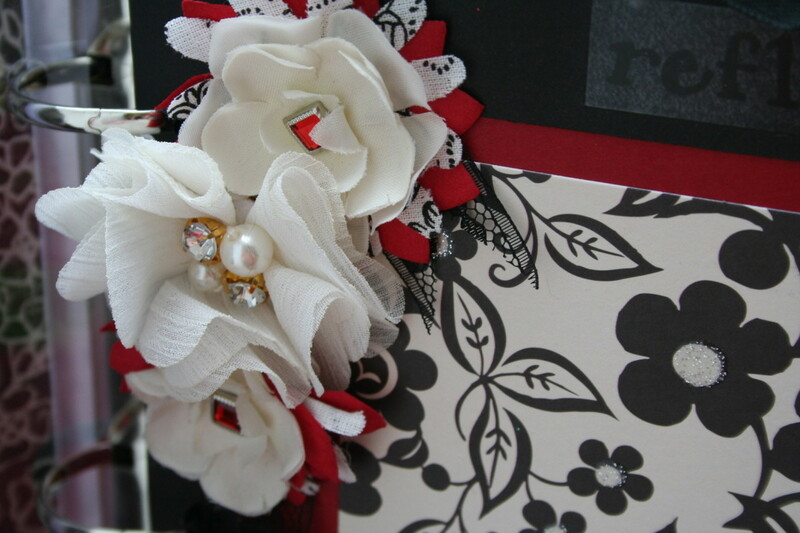 On page 8, I used ribbon at the bottom of the page decorated with craft pearls. On page 9, I used ribbon at the bottom of the page decorated with a bow. Not all pages have to be perfectly the same each time. 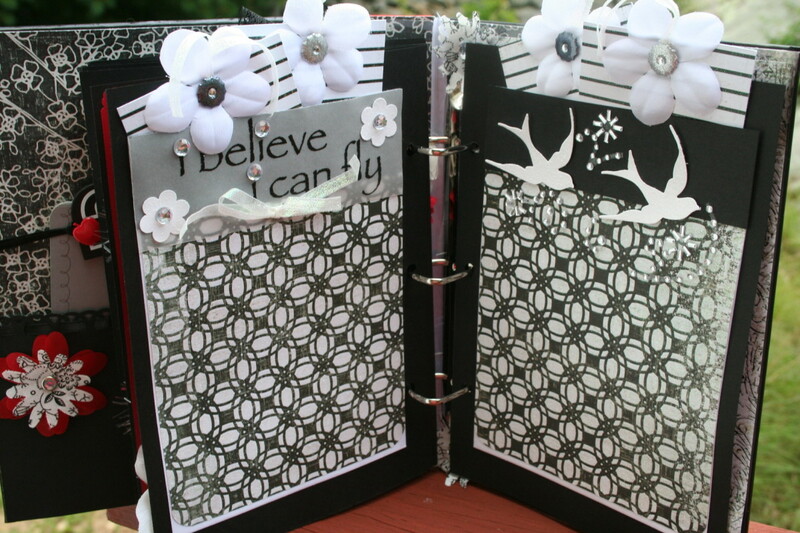 It adds interest to change the embellishments from one page to the next. Mixing up phrases and embellishments. It's fun to be creative when playing with words and phrases. One of the things I did when working on this album was to pair up some bird die cuts with a phrase. 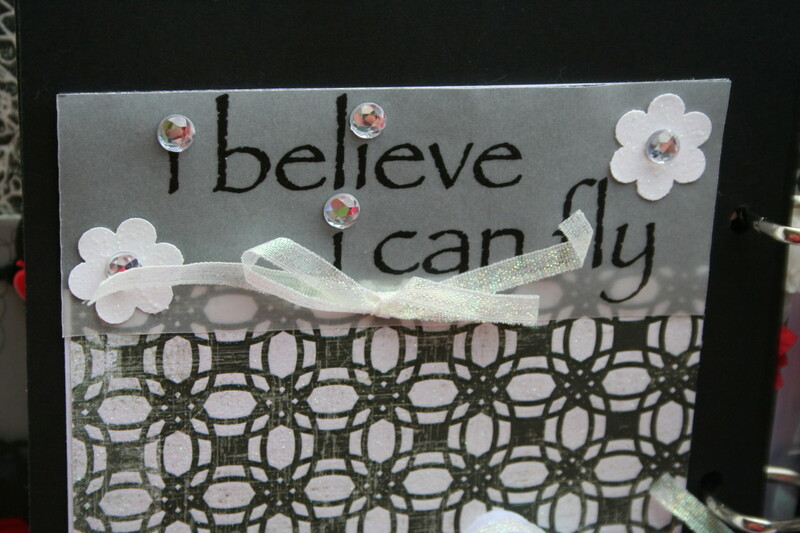 I found the vellum phrase, "I believe I can fly", in my craft stash. The first thing I thought about were birds. I have a few different bird die cuts in my craft studio. I played around with a few of them until I found the right size for my pages. 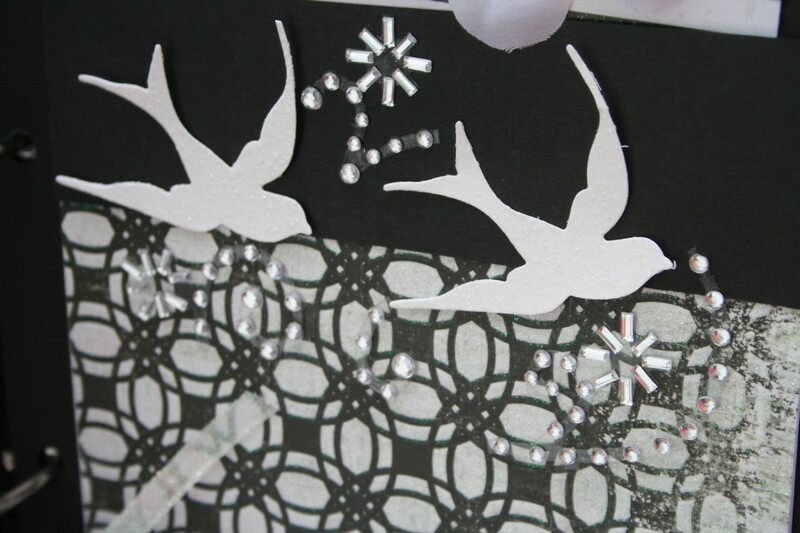 I just love the look of these birds and using them with acrylic self-adhesive rhinestones make them sparkle! On pages 10 and 11, I used two journaling tags per page. They are smaller tags. I think they look nice decorated with flowers and glitter brads. Preparing the inside covers, first and last pages. There are 15 pages in this album if you count the inside front and back covers. Using the same cardstock, I decorated the inside front cover and spine. 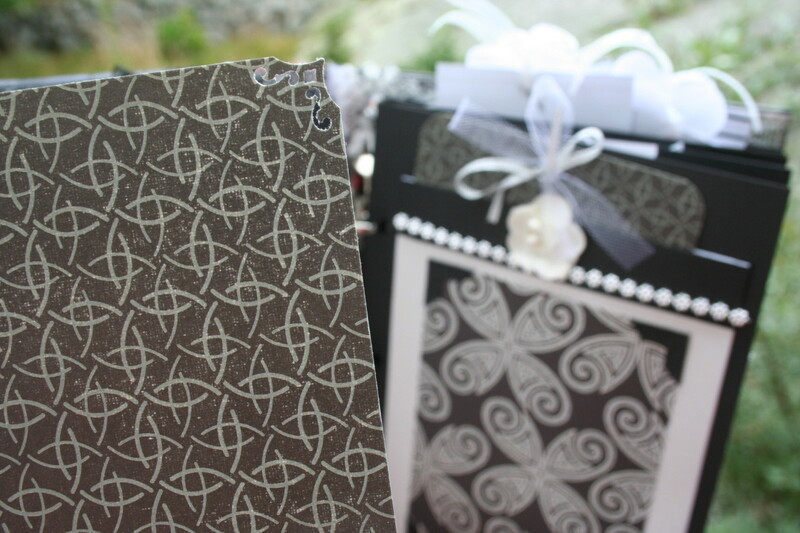 The inside front cover has a pocket, decorated with a decorative punch and threaded with ribbon. I added a flower and a graduation gown sticker for dimension. There is a two-page journaling tag that comes out of the pocket. The 2013 decoration is from the party aisle at the store. I used an apple brad to adhere the 2013 decoration. The tags swivel open with the brad closure. The first page is decorated with a flower design I created out of handmade assembled flowers, and a lady's pin I picked up on clearance at a fashion store. Inside front cover and page 1. Back cover and last page. In the party aisle, I also found a package of die cut graduation hats. I found one in the package just the right size for this album. 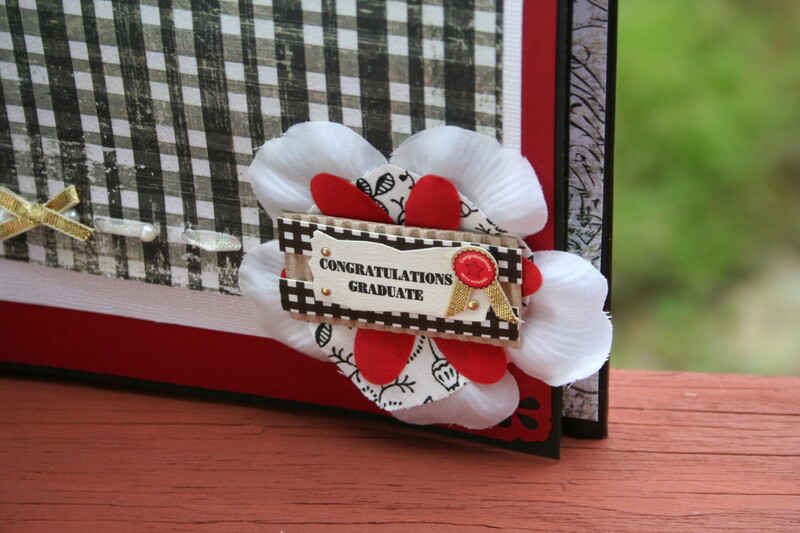 I created a small graduation diploma out of white cardstock rolled up and tied with baker's twine! The last page has a unique flip-up style journaling spot. I created it this way to add interest to the album. I wanted the back page to look a little different and to have extra room for co-graduates to write congratulation wishes. Some things to note about the last page. 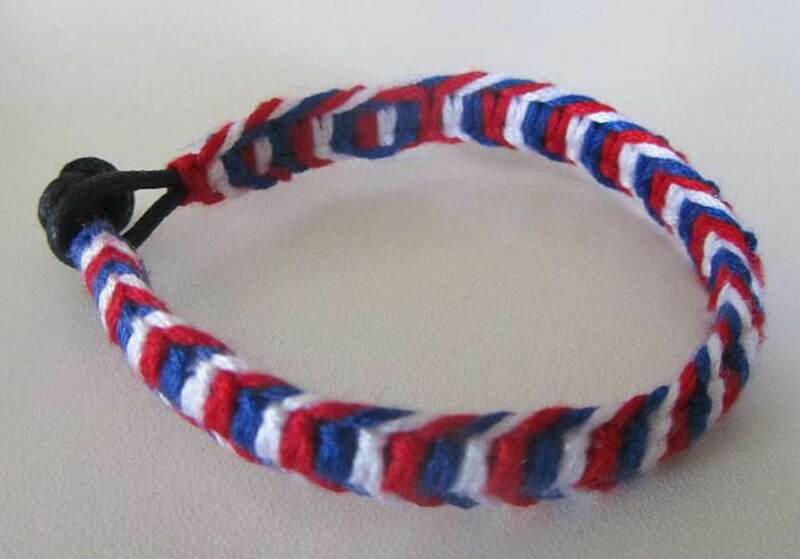 There are three different designs that coordinated well together. Polkadots, floral and swirl. 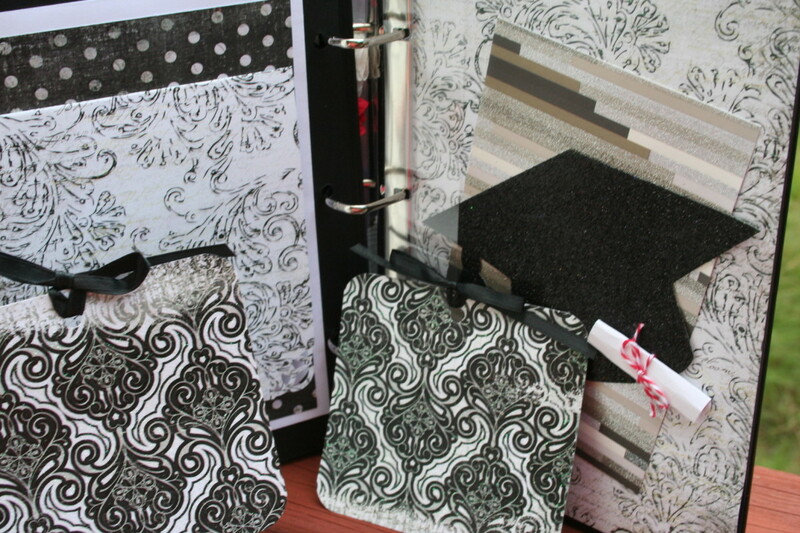 They are all black and white pages, but sometimes you can use different patterns to create a look without clashing. I used a decorative corner punch. 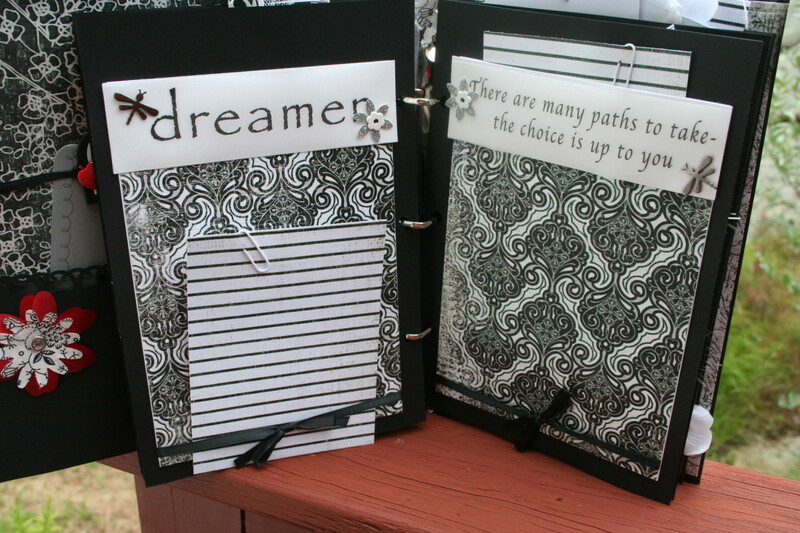 Some of the other pages I used a corner rounder. I created handmade fabric flowers out of my die cuts and decorated them with bling. The pockets throughout this album were created with envelopes. I glued the flaps of the envelopes down and cut off the top part. 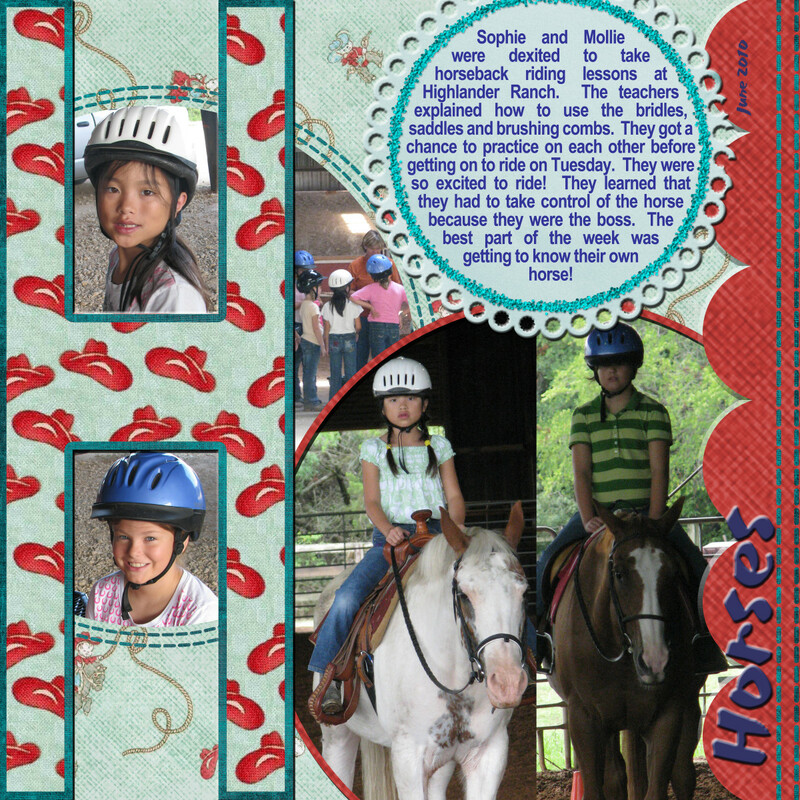 I adhered them to each base page before creating the photo mats. The tags slide with ease in the envelope pockets. I also used acrylic sheets cut in to two strips. They are at the beginning and end of the album, before the first and last page. I did that to help the base page slide around the rings with ease and without ripping. The acrylic strips help glide the pages easier. 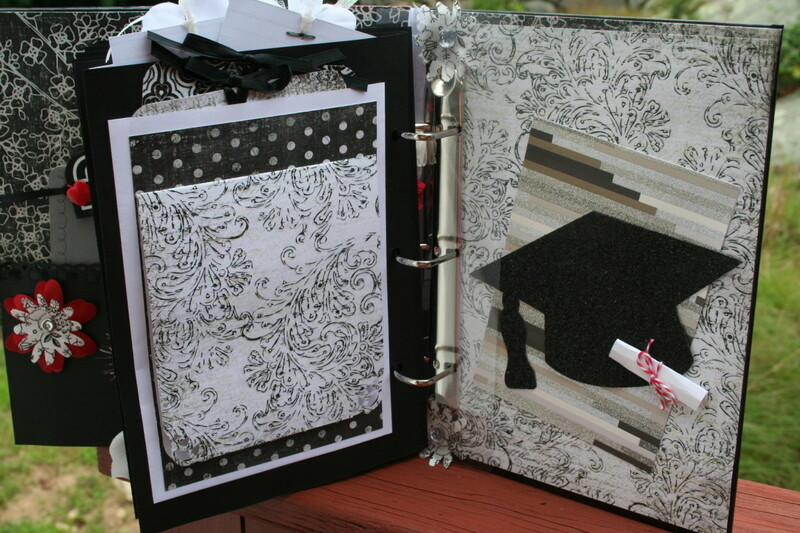 I hope you've enjoyed reading this article on creating a scrapbook graduation album you can gift to someone. Inspiration comes from the heart. Crafty, congrats on HOTD! 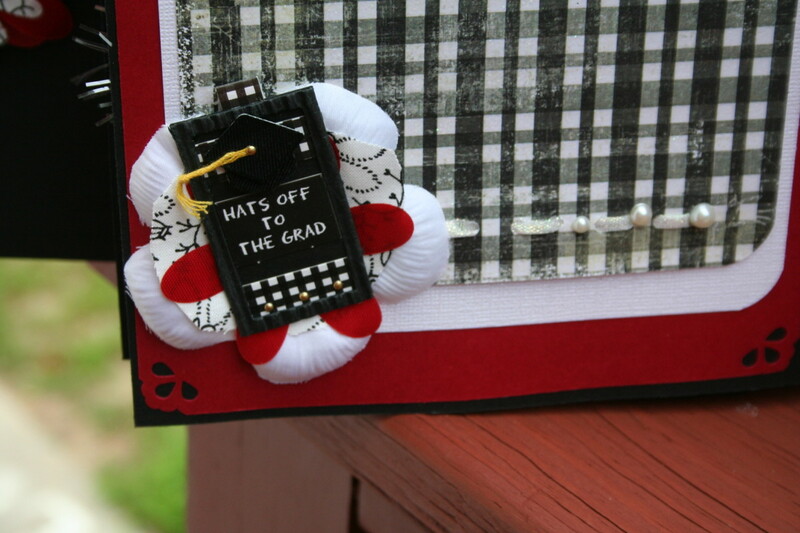 This is a clever idea to give to your graduate, whether it's high school or college. It's so resourceful and crafty to make it from scratch and from the heart to give us a gift. It looks like fun for this inventive idea. Lovely pics to go to the instructions, too! Thanks for sharing! 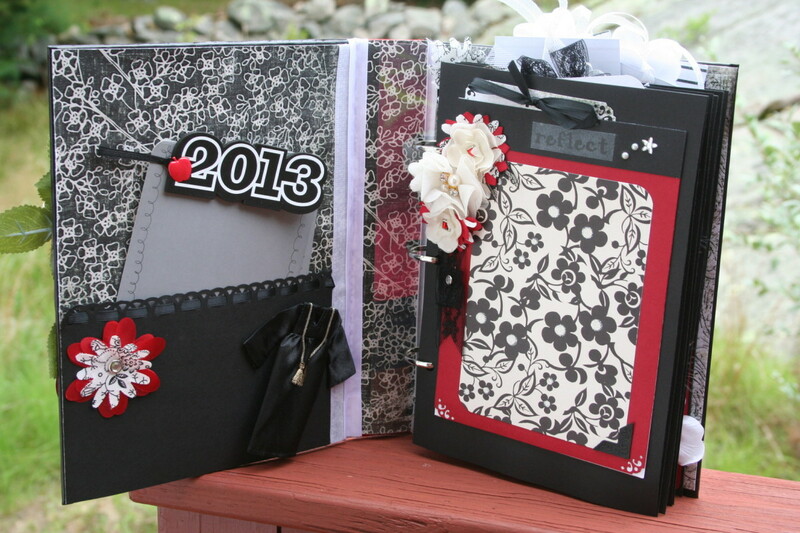 I loved your suggestions for creating the graduation scrapbook album. 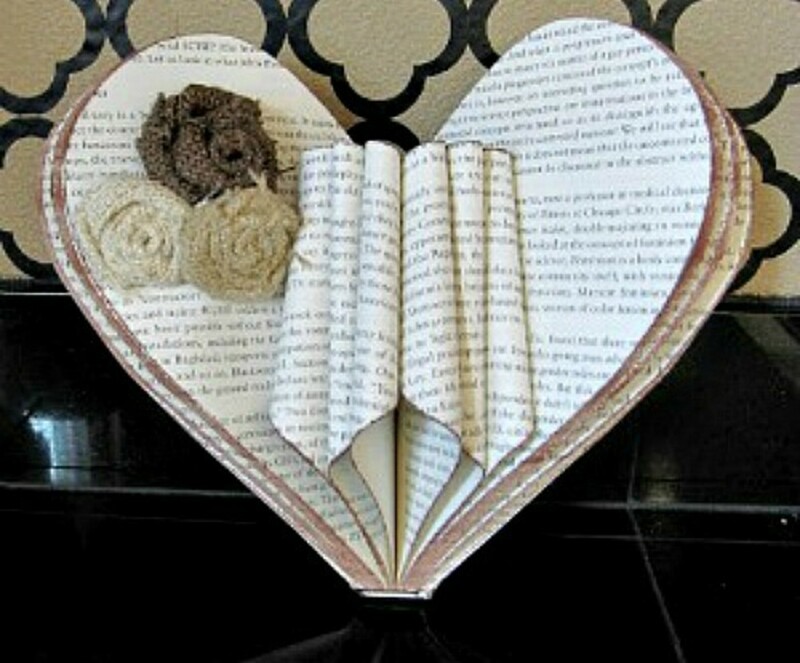 One can make this for self as well as for gifting purpose. The colours and materials you have used for this project are very decent. It's exciting to see how much you've grown, and so fast - write on! That was like running into an old friend... I'll be sure to check back in with ya soon again. Hi Jess! This particular scrapbook I made for a graduation ceremony for a friend. I have not made them to sell. 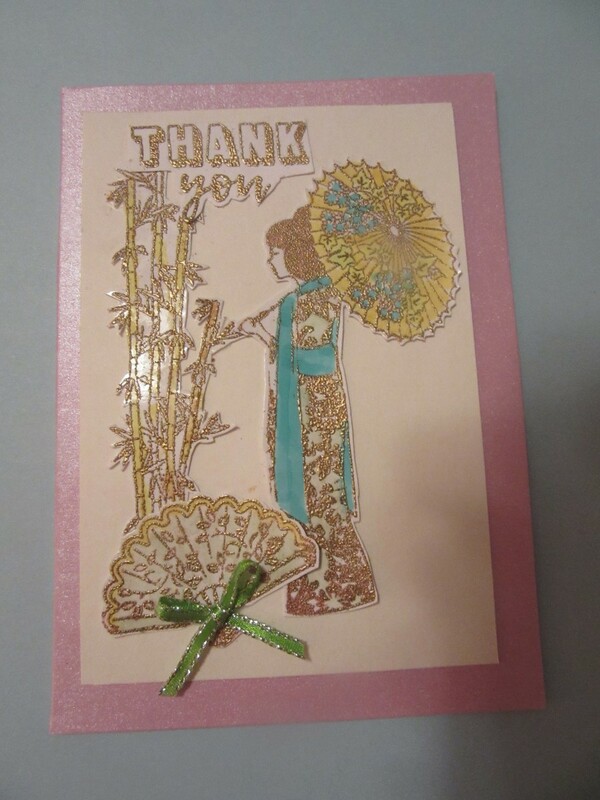 I do sell custom work, but mostly greeting cards and scrapbook layouts. Thanks so much for stopping by and commenting! I love your scrap book. I like how you design it. Do you do this as hobby? Hey Peach! Thank you for your comment! The supplies to make this particular album cost over $40, so I don't think I could even get the money back if I had tried to sell it. But, I went to a graduation party over the weekend and gifted it to the Valedictorian graduate who has started college a year early! She's such a smarty! Even though it wasn't her school colors she loved the album. I like to make things. This is a good project idea. Voted up. Thank you! 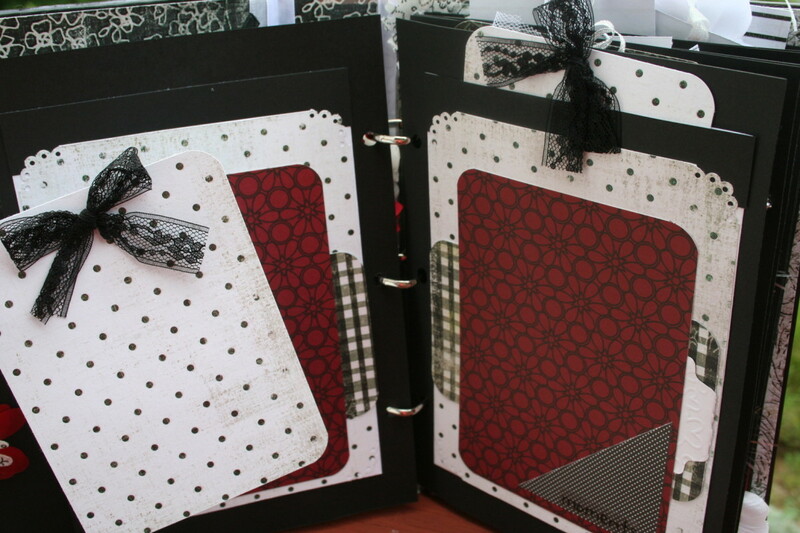 I had a lot of fun working on this scrapbook album. 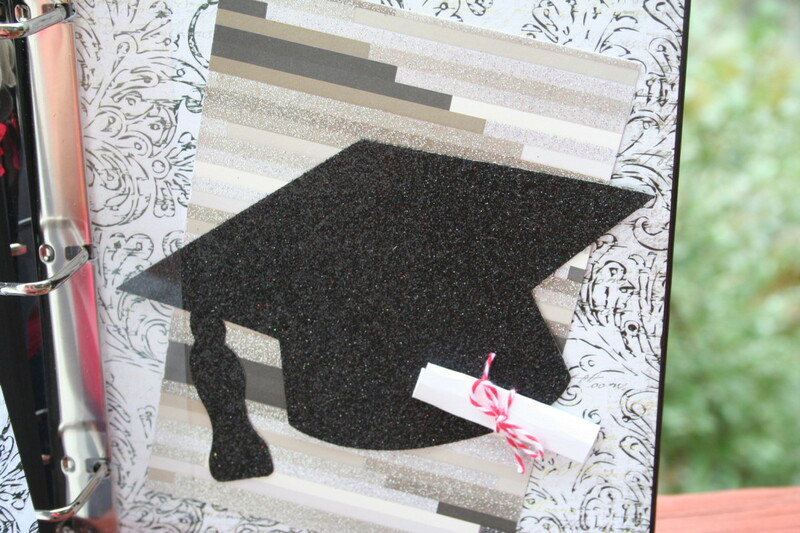 Well written hub on Creating a Graduation Scrapbook. Voted up.